Nancy Christie captures the imagination with a few deft strokes of prose, creating incisive and insightful character studies about people trying to survive the modern everyday. Nancy Christie is quickly becoming known for her poignant, beautifully crafted fiction, such as the eBook short stories "Annabelle" and "Alice in Wonderland," both published by Pixel Hall Press's imprint, PHP Shorts. As Morrow Wilson (the author of "David Sunshine") has said, "[Christie's] is a remarkable new voice that, like its song, is unforgettable." So it's no surprise that both Every Writer and HyperText Magazine have recently published two of her short stories on the Internet. "In Springtime," which appears in Every Writer, is a concise, beautifully drawn portrait of a woman -- Alice -- who dreams of her grandmother's garden. "There had been space and light for things to grow at her grandmother’s house," Christie writes, "unlike here in the city where even weeds had a difficult time breaking through the ever-present asphalt." It's a tightly written and highly revealing few paragraphs that tells us more about Alice's life and broken dreams than the character might realize. Showing off Christies' versatility, "The Answering Machine" (in HyperText) offers a far more detailed and intimate view inside the head of a salesman whose anger at his boss, his ex-wife, and the world at large is eroding his sanity. COMING SOON: "TRAVELING LEFT OF CENTER AND OTHER STORIES"
Pixel Hall Press has collected eighteen of Christie's hypnotically lyrical short stories into "Traveling Left of Center and Other Stories," which will be published as a trade paperback and eBook (in all formats) on September 9, 2014. The characters in these stories are unable or unwilling to seize control over their lives, relying instead on coping methods that range from the passive and the aggressive to the humorous and hopeful. But the outcomes may not be what they anticipated or desired. 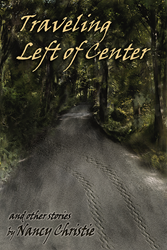 Reviewers and book bloggers should contact Cynthia Dadson (Cynthia[at]PixelHallPress[dot]com) to request review copies of "Traveling Left of Center and Other Stories." Nancy Christie is a full-time writer whose passion is fiction. Having written for numerous magazines and journals, her short stories can be found in literary publications such as Full of Crow, Fiction365, Red Fez, Wanderings, The Chaffin Journal and Xtreme. Christie is currently working on several book projects, including a novel and a book for writers. She is the founder of Celebrate Short Fiction Day. A member of the American Society of Journalists and Authors, Nancy teaches workshops at writing conferences and schools across the country, and hosts the monthly Monday Night Writers group in Canfield, Ohio.